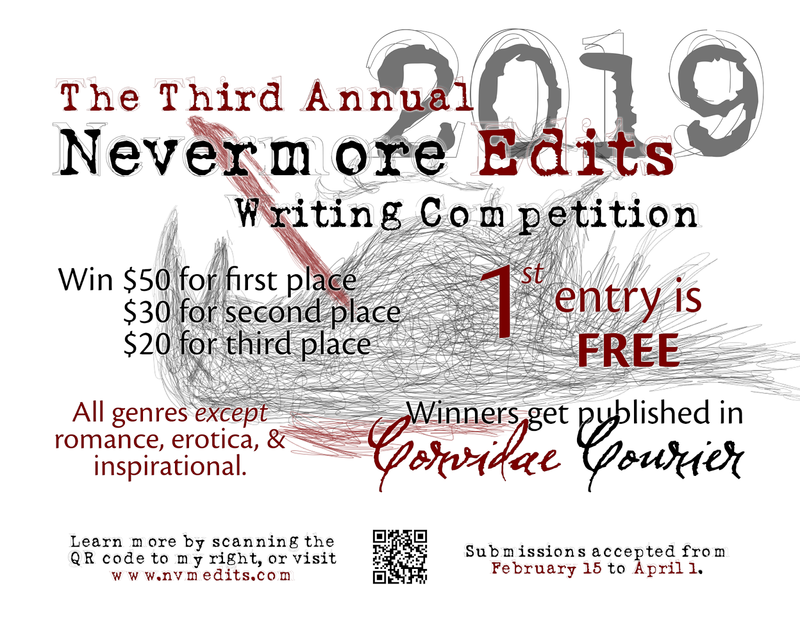 Nevermore Edits is proud to announce the Third Annual Nevermore Edits Writing Competition! The contest will run from February 15 to April 5, 2019. 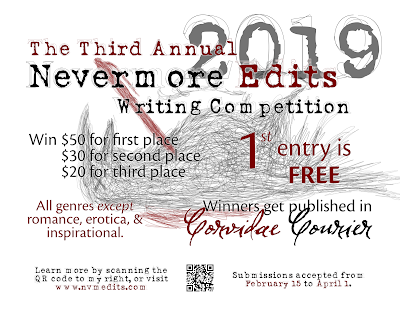 Three skilled winners will be published in the Summer issue of Corvidae Courier. The last day to enter the contest is April 5, 2019, but you don't want to wait until the last day! Any entries that arrive after 11:59:59 p.m. CDT on April 5, 2019, will be ineligible to win. What do you need to do to enter? Simple. First, you need a working email address. Next, you need to write a flash fiction manuscript. Your manuscript can be in any genre except romance, erotica, and inspirational fiction. We're a writing group that focuses primarily in the area of critique, and we feel equipped to tackle any genre except for the ones we've excluded. We just don't think we can give manuscripts in those genres a fair shake. We’ve rethought our entry fee policy from previous years. Anyone may enter one submission for free. A second submission will cost one dollar, and the third will cost $2. Every submission after that will cost $3. There is no limit on how many submissions any one person submits, but individuals are only eligible to place once. Here's a quick shakedown of the rules and procedures. For any questions about the administration of the contest, you can email me and ask me anything. Your submission should be formatted using accepted industry standards. English manuscripts only! Very few of our judges are polyglots. We will not accept any manuscripts that are published before May 1st! Keep your manuscript short—no longer than 500 words. Make sure each page is numbered, and include the title of the manuscript in the header. The manuscript should have no author-identifying information. If you put your name in the header, remove it now. Email your manuscript as an attachment to contest@nvmedits.com. In that email's subject line, include the title of the manuscript. In the body of that email, include your legal name, your pen name, your mailing address, and your phone number. If you want to include a short author bio, we wouldn't mind that at all. As stated above, your first submission is free. The next costs $1 and the one after that costs $2. Every one after costs $3, and you'll pay that by clicking the button below. There is no limit for the number of entries, but you can only place once. You'll be asked to enter your pen name during payment. Make sure you do that, so that we can tie your submission to your payment! Submissions that do not have a corresponding entry fee payment by 11:59 p.m. CDT on April 15, 2018, will be disqualified. If you did all the stuff I put in bold, you should be good. Just in case, though, you might want to check out the long-form of the Official Rules. You must be an adult, and you cannot be a Trustee of Nevermore Edits to enter. Please email me if you would like to enter more than 10 manuscripts into this year's competition! Although the option is not available above, it is possible to do so, but you need the Administrator's special touch. First place wins $50 and a critique on a work-in-progress of their choice by the judges and readers! Second place wins $30! Third place wins $20! All three of these winners get published in Corvidae Courier, to be released after the winners are announced on July 1, 2019. You want to enter 5 manuscripts into our contest, but you're not sure how much you owe us. Just use the table below! Want to know more about the contest? Read our Official Rules! Get to know Our Judges! Once you've done all that, you're ready to send us your stuff. We can't wait to read it!